It is a moderate-demanding hike to Sun Gate (Intipunku); Which was at some point the main entrance to the Inca city of Machu Picchu. This trek follows a trail that originally belonged to the network of Inca roads (qhapaq ñan). It is located directly south of the citadel. This trek has no additional cost, and can be done with the entry ticket to Machu Picchu. It takes about 3 or 4 hours (round trip). How to find the entry point? 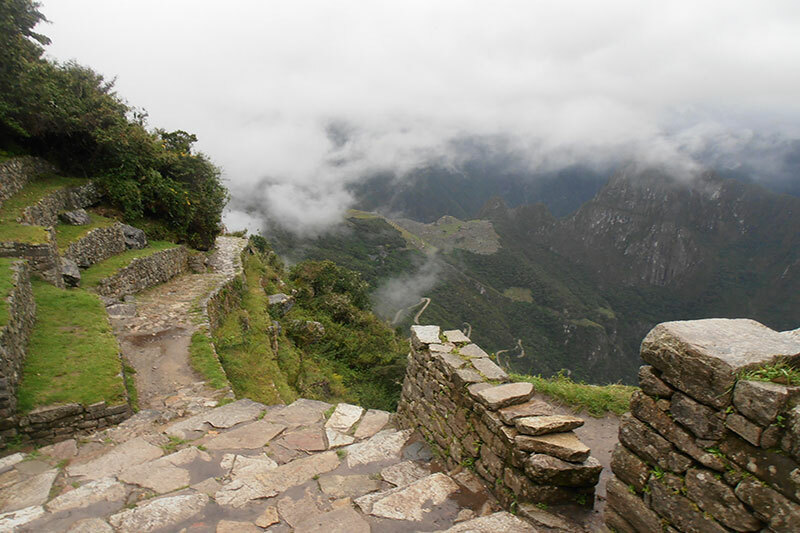 Follow the upper path, from the entrance gate to the citadel of Machu Picchu. From the point known as the “guardian’s house”, you will have to turn left and continue along the trail that leads away from the citadel of Machu Picchu , through the agricultural terraces. The trail is clearly signposted, there really is not a special place to start this hike, but you might consider the keeper’s house as a good starting point. From the “guard house”, the road continues straight, by stone steps of the original Inca Trail. Unlike the Machu Picchu mountain hike that runs parallel to it, the ascent of the trek to the Sun Gate (Intipunku) is more gradual, at an angle of no more than 30º. However, in the last 20 minutes as you approach the sun’s door, the slope becomes more accentuated and the road becomes more difficult. The gate of the sun is also the entrance gate for the hikers who arrive after traveling the 4 days of the Inca Trail to Machu Picchu. If you decide to walk to the door of the sun before 10 in the morning, you will surely meet the people who traveled the Inca Trail to Machu Picchu. It is known that in the heyday of the Incas, the imperial guards used the door of the sun, to control the entrance of the people to the Inca city of Machu Picchu; This, in combination with their remote location, made them think that at Machu Picchu, only people were received from the elite of the empire, but then it was learned that anyone could enter and give an offering in Machu Picchu, although he could not remain in the place. If you continue along the path of Sun Gate for another 2 hours, you will reach another of the beautiful Inca citadels, Wiñay Wayna; Last point of control of the Inca road, however, the entrance beyond this control point, is restricted, since permits are needed for the entrance to the Inca Trail. To carry out the walk to the Sun Gate (intipunku) , an average physical level is required; However, the road is wide and much less rugged, than other excursions offered by the Inca city of Machu Picchu. Time required: 3 – 4 hours round trip. Groundt in relation to Machu Picchu: 290 meters. Land: Inca trail of stone and paths of grass and earth. Check-in time: as Machu Picchu from 6:00 a.m. to 4:00 p.m., being able to stay in until 5:00 pm. It is not recommended to start the walk after 14:00 hrs. Tickets: According to admission to Machu Picchu limited to 2500 daily income. To take the walk to the Sun Gate in Machu Picchu, there is no need for an additional ticket, it will suffice with your ticket to enter Machu Picchu (in any of its modalities). The walk to Sun Gate (Intipunku) is available throughout the year, but keep in mind that during the rainy season (November – April), heavy rains are more likely. The region has a subtropical climate throughout the year, with average temperatures around 18º C. In the dry season the humidity is around 40 and 45%, while in the rainy season it reaches 60 and 65%. Since the climate in the southern region of Peru is unpredictable, we recommend preparing for both rain and sun. It is advisable to wear a light rain poncho and sun protection (hat, blocker and lenses with UV protection), regardless of the time you visit Machu Picchu, as there are usually scattered rain at any time of the year, regardless of the season. It is recommended to carry enough water during the walk. Water: from 1 ½ to 2 liters of water. Hat for the sun, sunglasses and sun protection.